BER Galway are SEAI registered BER assessors providing the best prices in Galway for BER Certs. BER Rating what is it? 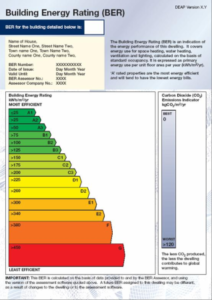 A Building Energy Rating (BER) is an indication of the energy performance of a home. A Building Energy Rating (BER) is similar to the energy label for a household electrical appliance like your fridge. The label has a scale of A-G. A-rated homes are the most energy efficient and will tend to have the lowest energy bills. A Building Energy Rating (BER) certificate is accompanied by an advisory report which will identify how you might improve the energy performance of your home. A Building Energy Rating (BER) is also required, subject to transitional arrangements, where construction of a new home begins on or after 1st January 2007.
Who needs a BER Galway cert? New homes where planning permission was applied for on or after the 1st of January 2007. A new dwelling (i.e. a dwelling that has never been sold or occupied) is exempt from the BER requirement if it had been the subject of a planning application submitted on or before 31 December 2006 and if it was substantially completed by 30 June 2008. “Substantially completed” means that the external walls have been erected. All existing homes for sale or rent on or after the 1st of January 2009. An existing dwelling is a dwelling which has previously been sold and/or occupied. Building Energy Rating (BER) assessments performed on new dwellings will also help determine compliance to Part L of the Building Regulations. There are exemptions for certain categories of buildings (Ref. S.I. No.666 of 2006). Who carries out a Building Energy Rating (BER) Assessment? How much does a Building Energy Rating in Galway cost? There is no set fee for a BER and it is a matter for a BER Assessor to charge as they deem appropriate for the particular services offered. SEAI strongly recommend to all people wishing to commission a BER assessment to shop around for the best price and if possible to check references with other clients. Assessors are charged a levy of €25 to submit a BER assessment to the national BER database and this must be included in the price charged. Once you have selected your Assessor the Assessor will make an appointment to visit your home so that they can complete a BER assessment survey on it. When the Assessor arrives at your home they will conduct a non intrusive survey. A Building Energy Rating (BER) assessment will typically take a couple of hours to complete (depending of course on the home size and complexity). The Assessor will need to have access to all the rooms in your home. During the survey they will be measuring the area of the rooms, measuring the windows, the thickness of the walls, the levels of insulation, the heating system, the number of flues, the floor types and the wall types. The Building Energy Rating Assessor will typically collect 80 pieces of data which describe your home, which are then entered by the Assessor into the BER software tool in order to generate the BER. What happens after the Building Energy Rating survey? A BER Galway Assessor will return to their office and input the survey findings into the BER assessment software called DEAP. There are approximately 80 data inputs that the Assessor must enter. Once this is complete the Assessor will log on to the online SEAI National Administration System (NAS) and upload the DEAP file. This will generate the BER Certificate and the Advisory Report. A BER Galway Assessor will then give the homeowner a copy of the BER Cert and the Advisory Report. A BER Galway Assessor will be able to answer any queries you have relating to your dwellings BER cert.